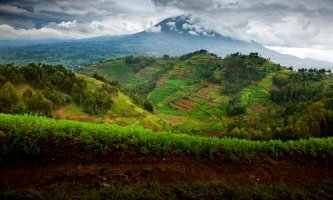 Rwanda is predominantly a country of rural farmers, with few natural resources. About 90% of the population is engaged in agriculture and the remainder in the service sector. Tea and coffee are the main exports of Rwanda trade. Since 2001, growth has been driven by exports to the tune of 5% in the last five years. Major export markets include China, Germany, and the United States. The economy of Rwanda is managed by the central National Bank of Rwanda and the currency is the Rwandan franc; in August 2015, the exchange rate was 755 francs to the United States dollar. Rwanda joined the East African Community in 2007, and has ratified a plan for monetary union amongst the five member nations. Crops grown in the country include coffee, tea, pyrethrum, bananas, beans, sorghum and potatoes. Coffee and tea are the major cash crops for export, with the high altitudes, steep slopes and volcanic soils providing favorable conditions. Reliance on agricultural exports makes Rwanda vulnerable to shifts in their prices. Animals raised in Rwanda include cows, goats, sheep, pigs, chicken, and rabbits, with geographical variation in the numbers of each. Production systems are mostly traditional, although there are a few intensive dairy farms around Kigali. Shortages of land and water, insufficient and poor-quality feed, and regular disease epidemics with insufficient veterinary services are major constraints that restrict output. The industrial sector is small. Products manufactured include cement, agricultural products, small-scale beverages, soap, furniture, shoes, plastic goods, textiles and cigarettes. Rwanda's mining industry is an important contributor to the economy. Minerals mined include cassiterite, wolframite, gold, and coltan, which is used in the manufacture of electronic and communication devices such as mobile phones. Rwanda's exports remained dominated by traditional products such as coffee and tea, minerals like tin, coltan, wolfram and cassiterite. Other exports include, tungsten ore, refined petroleum, cars, corn, wheat flours, beer. Rwanda's major exports partners are China, Germany, Tanzania, Democratic Republic of the Congo, Kenya, China, Malaysia, United States, Burundi. Rwanda's participation in global trade or even regional trade is still low. As a rapidly growing economy, Rwanda imports more than it exports leading to a growing trade deficit. Between 2008 and 2012 export growth averaged 26% compared with growth in imports of 18%. The latest trade data indicate that in 2012 merchandise exports grew by 28.13%, over 2011, compared to 11.40% growth in merchandise imports. To achieve Rwanda's economic growth trade is a fundamental function. The Government of Rwanda is making every effort to meet sustainable high export growth over import growth and achieve Vision 2020's ambitious target of 28% export growth per year. 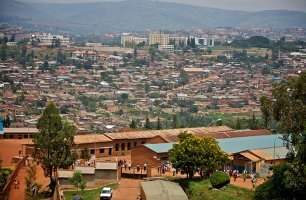 Despite Rwanda's fertile ecosystem, food production often does not keep pace with population growth, and food imports are required. Fishing takes place on the country's lakes, but stocks are very depleted, and import of live fish is being done in an attempt to revive the industry. The US is an important exporter to Rwanda, accounting for almost $10 million in imports annually since 1990-93, and over $40 million in 1994 and 1995. In 2007, the amount rose to approximately $17 million, a 20% increase over the 2006 level. Being a member of the Common Market for Eastern and Southern Africa (COMESA) and the East African Community, roughly 90% of Rwanda's imports come from COMESA countries and 34% from other African countries. Rwanda imports mainly food products, machinery and equipment, construction materials, petroleum products, fertilizers, raw sugar, planes, helicopters, spacecraft, telephones, computers. Major import partners of Rwanda are Kenya, Germany, Uganda, Belgium, China, India, Tanzania, United Arab Emirates. Rwanda is a country situated in central and east Africa, bordered by Uganda, Tanzania, Burundi and the Democratic Republic of the Congo. The country is a member of the United Nations, African Union, Commonwealth of Nations and East African Community. Goods for exportation other than goods to which the provisions of regulations 132, 133, 134 and 135 apply shall be entered using form C17 Form. Policy statement: The Department shall endeavour to facilitate the exportation of goods from Rwanda subject to such terms and relevant authorities in respect of goods being exported may lay down conditions as. Goods may only be exported or accepted for carriage for export after such declaration or other acceptable documentation has been delivered to Customs, by the exporter or agent, and duly processed. The goods specified in Part A of the Third Schedule are prohibited goods and the exportation of the goods is prohibited (Section70 (1)) of the EAC CMA. The goods specified in Part B of the Third Schedule are restricted goods and the exportation of the goods, save in accordance with any conditions regulating their exportation, is prohibited ((Section70 (2)) of the EAC CMA. Customs Officers must therefore ensure that regulations in force for the control of restrictions and prohibitions of exports of any particular goods are observed. Goods for commercial use intended for export must be entered on Customs declaration. The Customs procedure code to be entered will depend on the nature of the goods to be exported as per Customs Procedure Codes. Where goods are being exported as samples or being exported for purposes of repair or replacement due to faulty manufacture, a duly completed declaration must be presented to Customs. Failure to do so may result into full duty being collected on such goods upon return to Rwanda. In order to facilitate trade, RRA Customs Services Department has adopted some special regimes. This includes, Direct Delivery, Clearance on Truck, and Quick Release Regime offloads and Re-load of goods. Goods that are not offloaded in Kigali due to Contracts between the importer and the transporter e.g. Malt for BRALIRWA offloaded at GISENYI. The Clearing agent should fill the prescribed application form clearly specifying reasons for request of this special regime. This application should be addressed to the Commissioner for Customs & Excise. The clearing agent submits the approved form to the special regime desk for processing. If the application is approved, the Clearing agent prepares a provisional declaration and submits a copy to Special Regime Team office to calculate the correct amount to be deposited. After payment of the deposit, the Head of Special Regime Team allocates special regime officer to accompany the consignment and conduct physical examination at the importer’s premises.